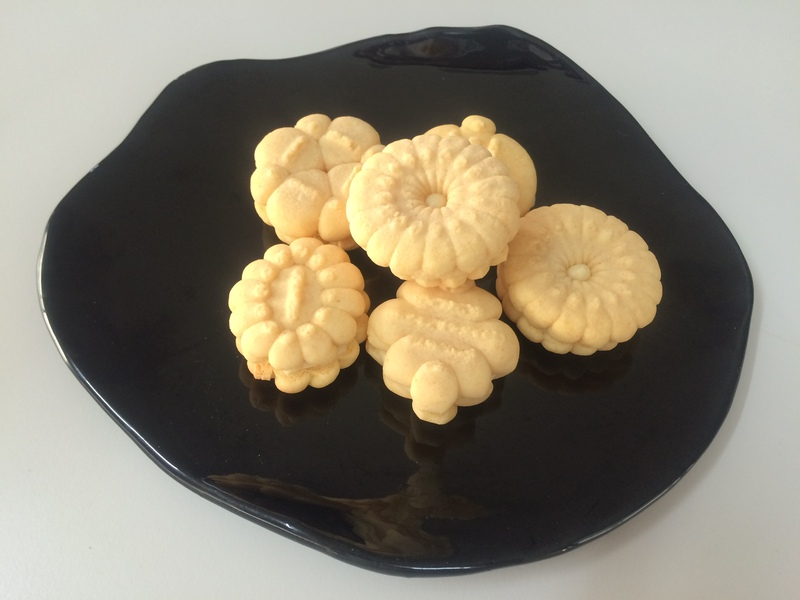 Passionfruit melting moments are lovely buttery cookies built on custard powder and sandwiched together with passionfruit icing for a tangy flavour contrast. If you don’t have access to fresh passionfruit, you can use tinned pulp. Alternately, if you prefer a lemon flavour, you can replace passionfruit pulp in the icing with lemon juice. If you can find an antique biscuit forcer (*), you can make a range of beautiful shapes; otherwise roll the dough into balls and press down with a fork. Pre-heat oven to 180 ºC (fan-forced). Cream butter with icing sugar until white and fluffy. Add salt and vanilla essence, then gradually work in custard powder and plain flour. The mixture should be just pulling away from the edge of the bowl after the flour is added: if it is a little soft, add slightly more flour, or if slightly dry, add a teaspoon or two more of vanilla essence. Roll into small balls, place on a greased, paper-lined baking tray and press down with a floured fork. Bake 6 min until just golden. Allow biscuits to cool slightly before removing from baking trays, as they are quite delicate. When fully cool, sandwich together with passionfruit icing. Makes about 30 complete biscuits. (*) It is possible to buy modern versions of the biscuit forcer/cookie press, but they are often made of quite thin metal which will not shape this dough. If you are buying a new item on-line, do a little investigation on the construction materials first. Alternately, if you are lucky, you might find an original item on Gumtree.